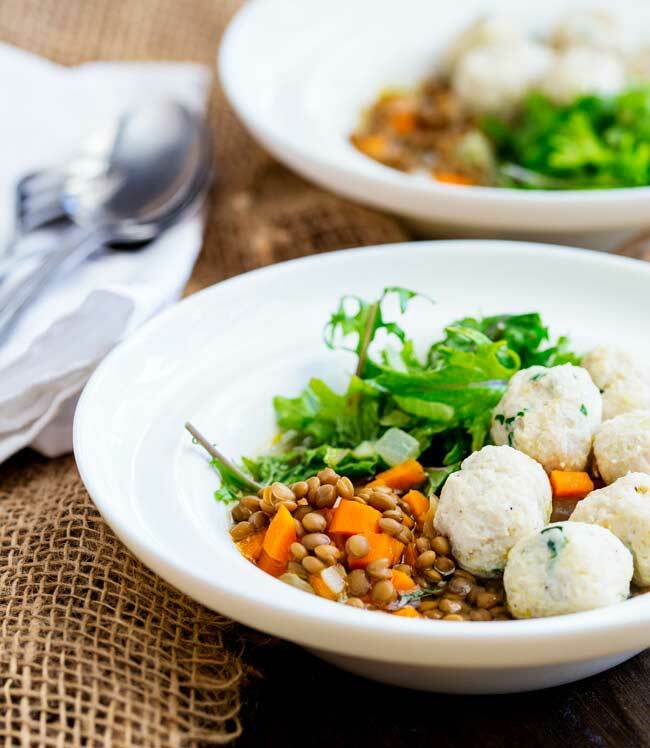 This Lentil Bowl with kale and chicken meatballs is the perfect mix of comfort food and healthy lunch. 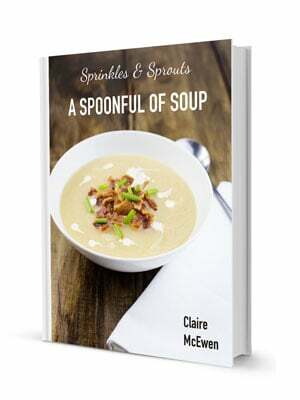 Hearty and warming without being heavy or stodgy but light enough for a warm day. It really is the dish for all seasons! I have just finished at chapel where Mr 6 got a certificate of recognition. You can see the gorgeous things his teacher wrote over on my instagram page. Super proud of my boys, they love school so much! Although Mr 9 is at the age where he hates homework. I know this as I heard it about a bazzilion times last night as he was trying to complete an acrossstick puzzle with compound words. There was a lot of muttering and mumbling!!! I am dreading high school homework!!!! 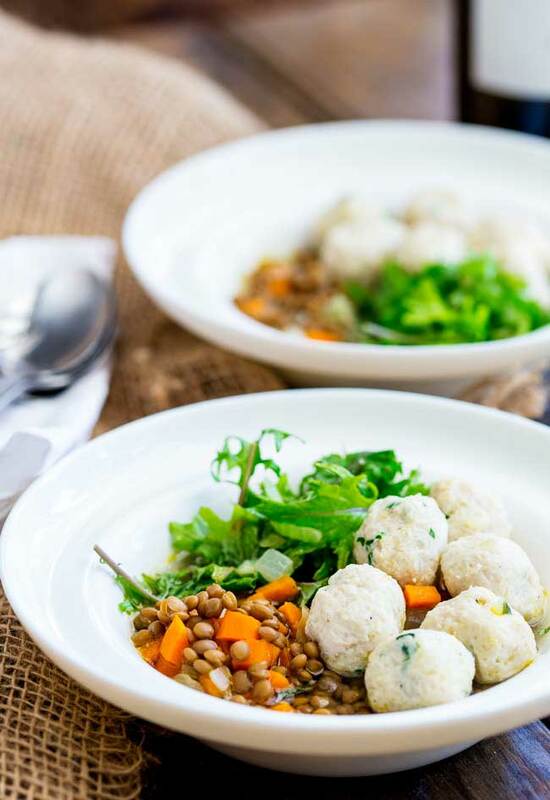 These chicken meatballs are delectably light making them the perfect partner to the earthy lentils and iron-y kale. (I use baby kale!) They have a little parmesan in them and a grating of parmesan over the whole dish is good. I forgot to add it to the finished dish when I was photographing them. Then I ate them and remembered! But by then it was too late. This works with dry lentils or cooked lentils from a can. I love canned lentils!!! As long as you buy the ones that aren’t full of salt, they are healthy and perfect for a last minute meal. I often add lentils to my spaghetti bolognase. They melt into the sauce and you can hide them from the children 😉 and you can use less meat! The meatballs are lightly poached which gives them the most beautiful texture. If you want some colour then you could pan fry them, but I love the softness you get from poaching, and you get added flavour from the chicken stock. 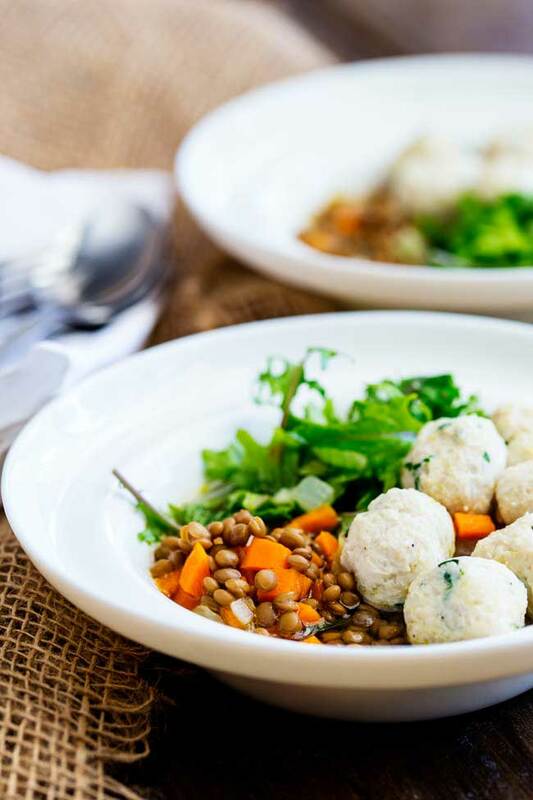 Has a lentil bowl ever looked as delicious and vibrant? Doesn’t it just screams healthy yet comforting! 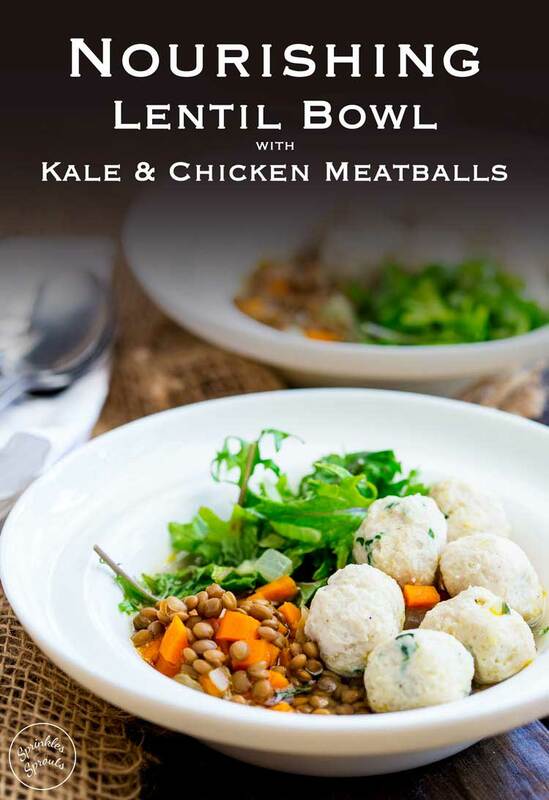 If you love this recipe for Lentil Bowls with Kale and Chicken Meatballs why not pin it for later. Start by making the meatballs. Mix all the ingredients together until they are just combined. Use a teaspoon to scoop out small amounts and form the mixture into small bite sized meatballs. Peel the onion and carrot and chop them both into small dice. Heat the olive oil in a large pan (one you have a lid for) and add the onion and carrot. Cook over a medium heat until the onion is translucent but not coloured. Pour in the stock, bring to a simmer and then add the lemon zest, dried basil and ground coriander. Simmer the veg for 5 minutes until the carrots are cooked. Reduce the heat to the lowest setting you can and then carefully place the meatballs into the stock. Cover and cook for 9 minutes. Add the cooked lentils to the broth to heat through for a minute. 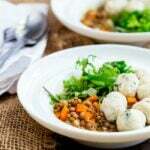 Use a slotted spoon to divide the lentils between 4 deep bowls. 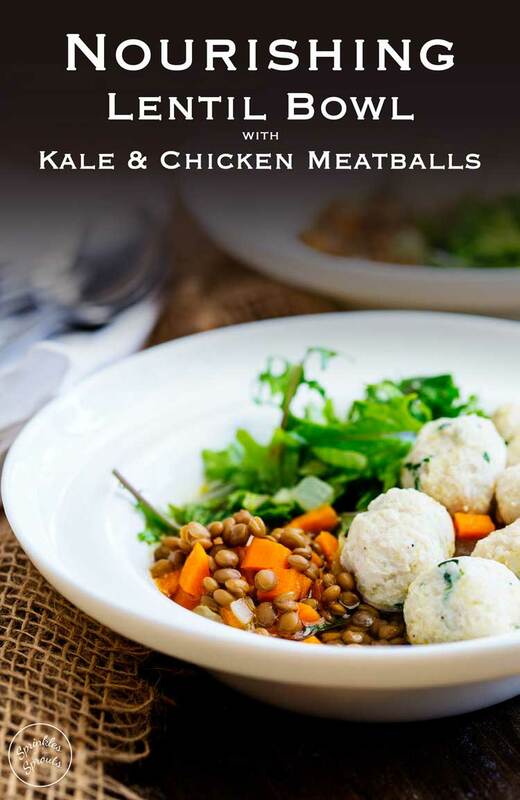 Add some kale to each bowl and portion out the meatballs. Carefully spoon the broth over the kale so it wilts slightly. Serve with an extra grating of parmesan. 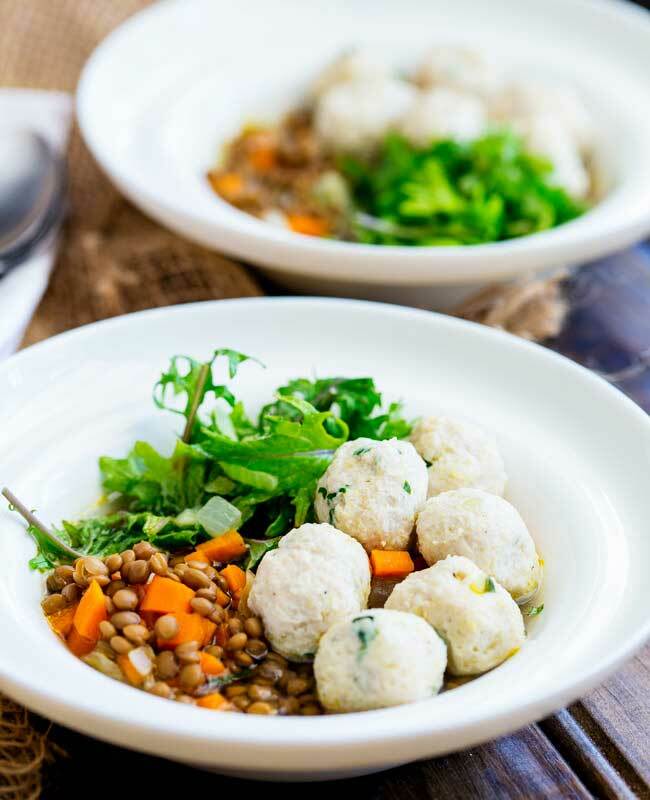 If you love food why not subscribe to my newsletter, I will drop you an email every now and then, just to say hi and send you a couple of recipes think you might love, like this Nourishing Lentil Bowl with Kale and Chicken Meatballs. Hi Claire. 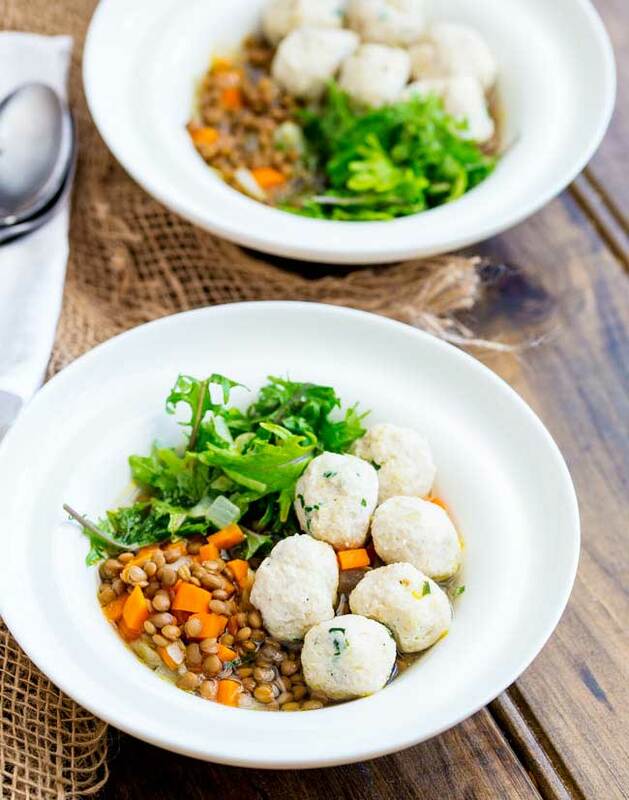 This sound really good except for one thing, I don’t like lentils (scowl at me if you wish). I would sub in cooked barley because I do love barley and I don’t think it would alter this too much, do you? I love barley!!! That would be a great substitution.